I've been in the development process for the exclusive Discerning Brute Suit Line (which will be available on BraveGentleMan.com soon!) and there are so many elements to making a good suit, and may of them are not at all animal-friendly. From bull-horn and buffalo buttons to wool fabric, from horse or goat or camel-hair interfacing and wool felt under-collar fabric, to silk thread, making a cruelty-free suit is no easy task. Many menswear factories are set up to provide stock-interfacing and thread - and bringing in your own alternatives sometimes poses problems. Things like buttons and interfacing are definitely more subtle elements of ethical fashion, but they are valid nonetheless. What visually and texturally distinguishes horn buttons from alternatives like tagua nut, wood, plastic, or coconut? The buttons in the image below are typical horn buttons, carved from the horns of animals like buffalo or bull. Definitely not cruelty-free, and definitely not sustainable considering the ecological impact of livestock production. 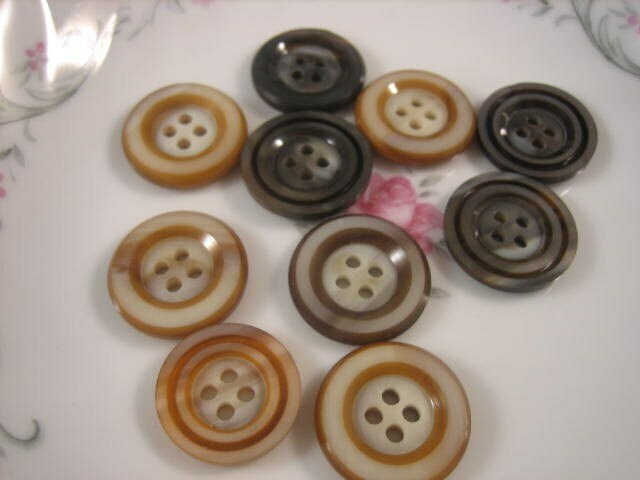 Horn buttons come in light brown, dark brown, black, amber, and ivory. They usually have an organic texture (run your fingernail along the rim and it should have a tiny ridges, like a worn-down quarter, and often they appear to be marbleized. Upon close inspection, they have depth in the lighter areas, which are slightly translucent. Horn buttons are also typically semi-matte - unlike plastic buttons which are smooth and uniformly shiny, though many mimic the marble patter and colors. Tagua Nut Buttons are a gorgeous, organic alternative to animal horn and plastic. 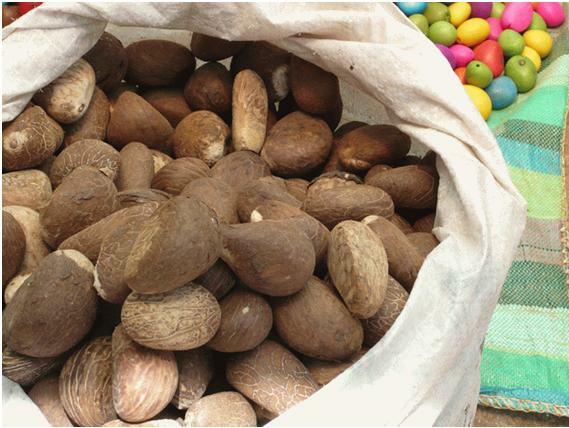 They are also called Corozo, mococha and vegetable ivory. Tagua has been used in since 1750 for toys, beads, and buttons. The Tagua nut comes in various colors, shades, and patterns, and are considered the "ivory of wood". Companies like Howies and Vaute Couture, who I've talked about on The Discerning Brute before, are now using Tagua Nut. The Tagua nut, it comes from a palm tree called Phytelephas Macrocarpa (a palm from South America). The nuts are gathered and dried out for 4-8 weeks, sorted and sliced. Their scientific name means "plant elephant" and the very hard white endosperm of their seeds (tagua nuts) resembles elephant ivory, does not break, and maintains the same properties as man-made buttons along with the texture and color patterning similar to horn. The Tagua Nut is sustainably harvested, often fairly traded, and does not require the cutting-down of trees (since it comes from the tree's nut). It also has such similar properties to Ivory that it has helped curb the poaching of elephants. What's not to like? Definitely look for Tagua Nut Buttons on my upcoming suit line!